After making flour tortillas last week, I thought I'd go ahead and make some corn tortillas this week. Despite having made flour tortillas countless times growing up, I have never made corn tortillas nor has my mom which is surprising. 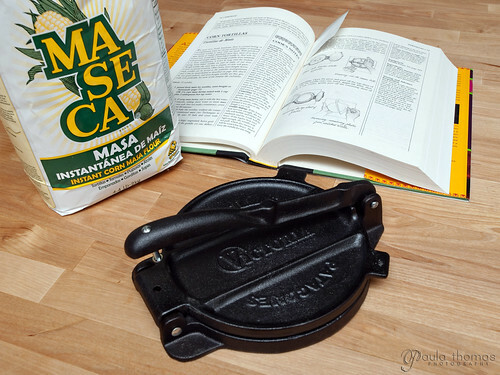 Corn tortillas are best made with a Cast Iron Tortilla Press . 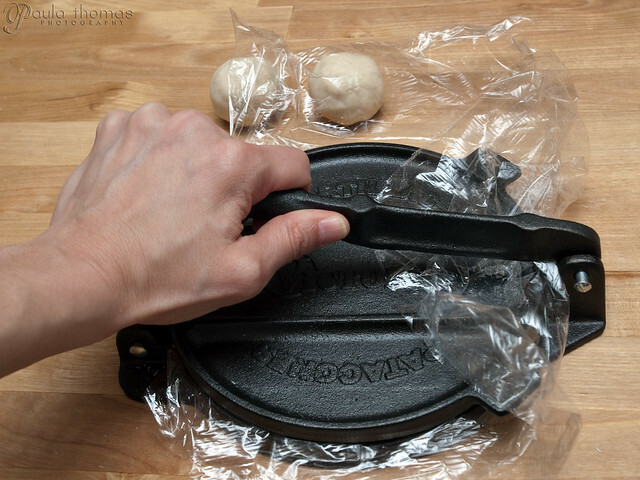 Most are made of cast iron and are relatively inexpensive. 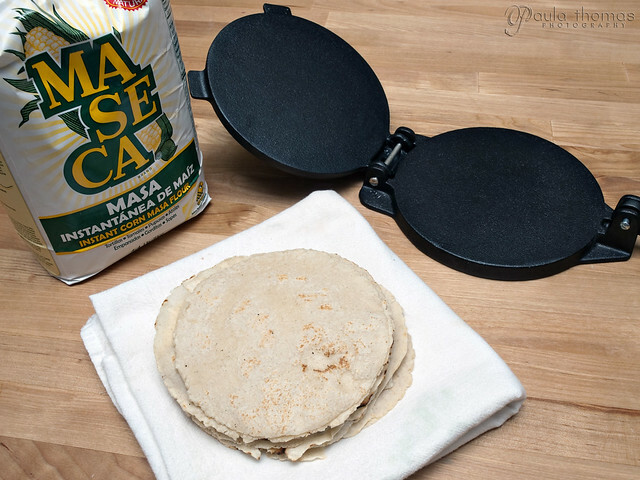 The dough or masa is made with only two ingredients, corn masa flour and warm water. It doesn't get any easier than that. They only thing is getting the consistency right. 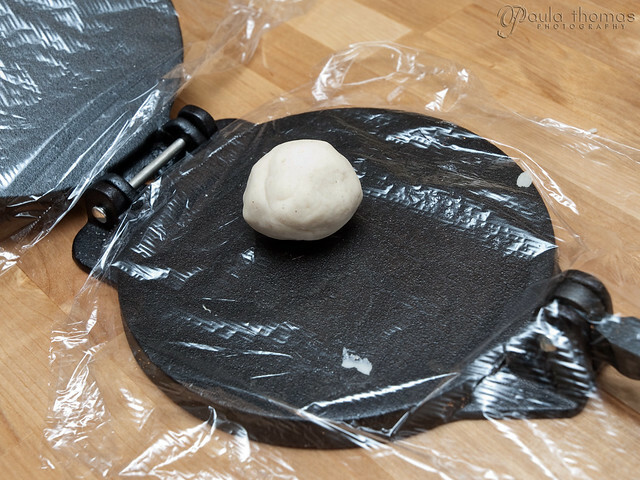 If it's too wet it will be sticky and if it's too dry the tortillas will crack so you want the dough to be pretty wet but just dry enough that it won't stick to your hands when you kneed it. It might take a few tries to get the size of the ball just right, kind of like a waffle iron. Put too much and it will spill out the sides. You also have to be careful how hard you press the dough because if you press too hard the tortilla will be thinner on one side. I didn't realize you need two griddle pans (low heat and high heat) to make these. I'm not sure if it's a trick Rick Bayless uses to make them or if this is a common way but I followed his instructions in the Authentic Mexican Cookbook. I used a cast iron one on the higher heat and a nonstick one on low heat. You first need to cook one side on the low heat and then transfer to the high heat and cook both sides. I cooked them long enough so they started to brown which I'm not sure was right or not. You don't see any browning on the store bought corn tortillas. They ended up turning out just fine and tasted great with the enchiladas I made so I guess the browning was fine. I didn't use any particular recipe for the enchiladas. 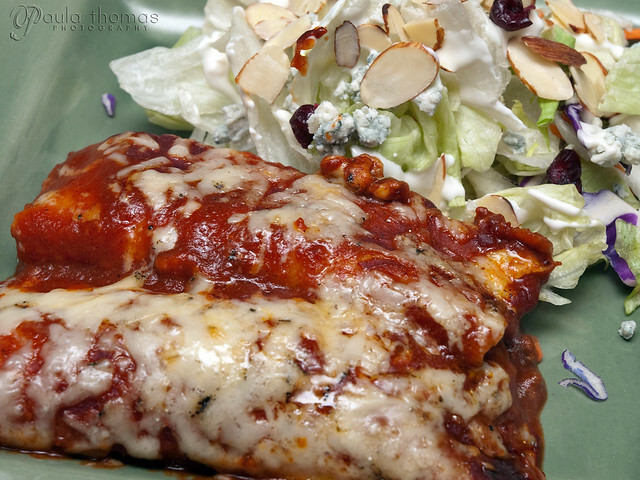 I basically stuffed them with taco meat mixed with some tomato sauce and then covered them in red enchilada sauce, topped with cheese and baked them for about 25 minutes. Mark enjoyed them so much he had seconds. Was the difference between store bought and homemade corn tortillas worth the effort? It does look like fun tho! I only used the corn tortillas for making enchiladas and I preferred the home made version for that. I can't speak for other things like tortilla chips, tacos, etc since I haven't tried making those with homemade yet. This looks SOOO delicious!! And I've already had lunch too!